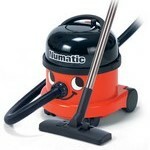 A complete range of domestic, commercial and industrial wet vacs, dry vacs and upright vacs for every conceivable task. All of these tub type vacuums from Numatic and Nilfisk perform well in the commercial world but are lightweight enough to be also ideal for domestic use. Designed for commercial use they are usually more powerful and more robust than your best domestic vacuum. A range of powerful commercial upright vacuums from both Karcher and Lindhaus. Although they are tough and durable they are also light enough to avoid operator fatigue and are a pleasure to use. These uprights incorporate a roller brush which helps prevent carpet compaction and gives excellent results from a single pass over the carpet. 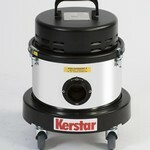 Commercial and Industrial Vacuum Cleaners. Here you will find a vacuum for nearly every conceivable task. Cleaning up dirt, dust, very fine dust, photocopier toner, dirty water, clean water, soot, flour, metal filings, woodshavings, sawdust and a multitude of other things. A choice of different models in 110 volt or 240 volt and tank capacities from 5 litres to 70 litres. Allow you the freedom to clean without the inconvenience of trailing leads. Especially valuable in situations such as cinemas and theatres where electric cables could be a hazard when cleaning seats and the floor areas between the seats. For the fast removal of dust and wood or plastic chips from industrial machine processes either for safe disposal or as in the case of woodchip for sale or further processing. A full range of both dry and wet and dry vacuums operated by compressed air for areas such as alcohol, powder and flour processing where an electrical spark would prove fatal. A massive range of accessories for Numatic vacuums including replacement tools for those already supplied with the machines and a number of other specialist tools not supplied as standard. Vacuum Cleaner Bags in Bulk. Save a fortune by buying your replacement paper bags in case lots at wholesale prices. Ideal for large users or customers, such as contract cleaners, who may have a number of machines.